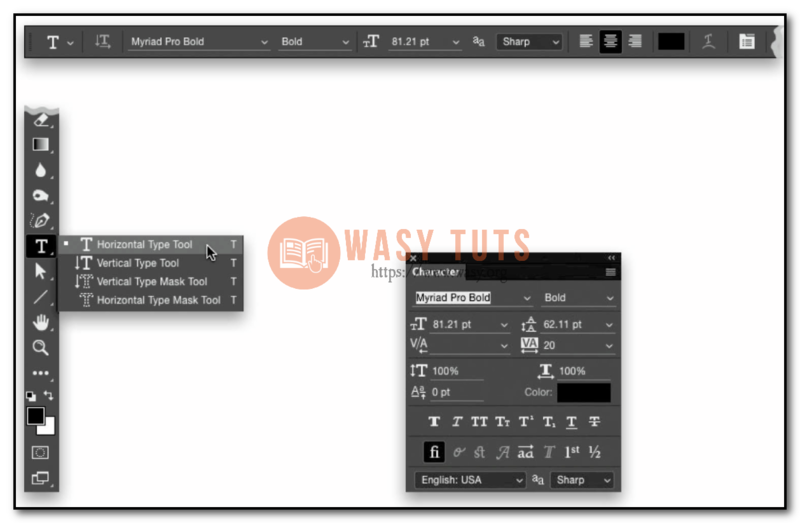 Get the Horizontal Type tool (T), click it somewhere within your image, and just start typing.You can choose your font and point size up in the Options Bar (when you start typing, it uses the last font and size you used. So, if you want to change your text font, just highlight it ﬁrst, then choose a new font from the pop-up menu). If you really want to access some serious type features, go under the Window menu and choose Character to bring up a panel with a ton of type controls (baseline shift, superscript, kerning, Open Type features, etc. Now, if all of that sounds like,“Huh?” you can probably skip opening this panel).When you start typing, it types in one long line, so you have to put in your own line breaks by hitting the Return (PC: Enter) key before your text goes past the edge of your image. If you know you want your text to ﬁt in a particular area, even before you start typing, then take the Horizontal Type tool and click-and-drag out a text box with the amount of space you want. Now, as you type, your text will automatically wrap to the next line (like you’re working in a regular text app). TIP: USE THE MOVE TOOL TO RESIZE TYPE: Once your type is in place, easily change its size by getting the Move tool from the Tool- box, then pressing Command-T (PC: Ctrl-T) to bring up Free Transform (it puts handles and a box around your type). Press-and-hold the Shift key (if you want to keep it proportional), grab a corner handle, and drag inward (to shrink your text) or outward (to make it larger).When you’re done, press the Return (PC: Enter) key to lock in your transformation. You could use the Line tool, and set it to aWidth of 1 pixel (see page 40), but for stuff like this, you might want to use the Pencil tool (it’s nested in theToolbox with the Brush tool; or press Shift-B until you have it). It draws a 1-pixel hard-edged line, by default—you just get the pencil and start drawing free-form with it. 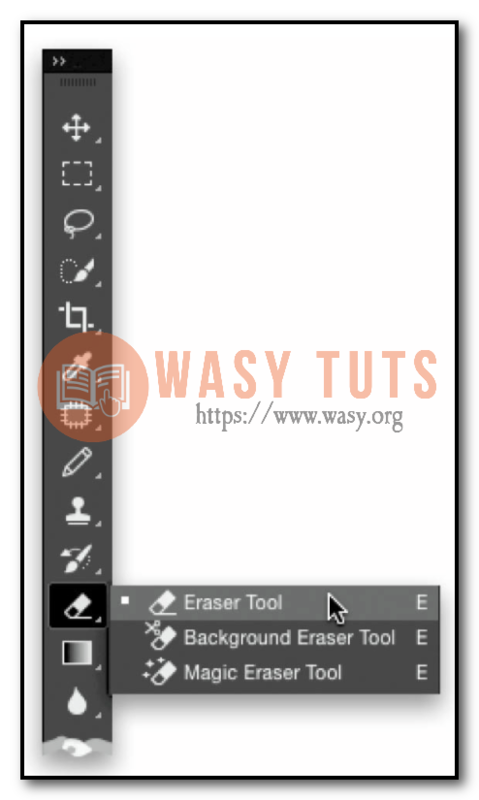 If you want to create a straight line, press-and-hold the Shift key ﬁrst, click the Pencil tool where you want your line to start, move your cursor to where you want it to end, click again, and it connects the two. It’s kind of a like a “connect-the-dots” tool at this point. Why, you’d use the Eraser tool (E), of course. Its icon looks like an eraser, and it simply eras- es pixels (it won’t work on erasing type because type isn’t made up of pixels. If you need to erase some type or parts of type, go to the Layers panel, Right-click on the type layer, and choose Rasterize Layer. That turns your type from a shape to pixels, and now you can use the Eraser tool at will). By default, it erases with a hard-edged brush tip (like a real eraser), but if you want a soft-edged eraser, you can choose one from the Brush Picker up in the Options Bar (just click on the brush thumbnail to open the Brush Picker). 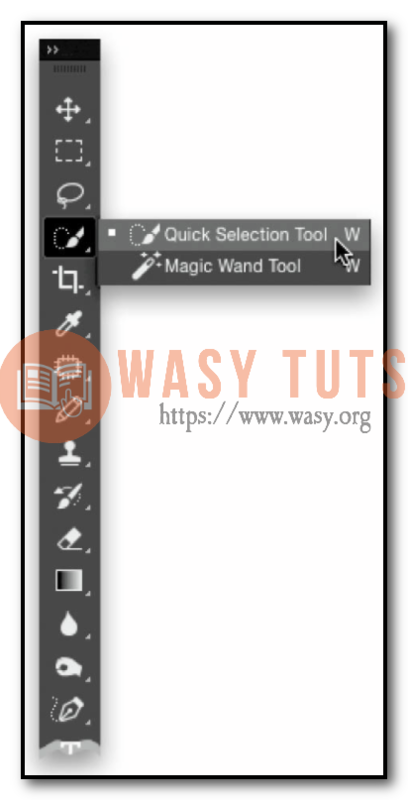 Get the Magic Wand tool from the Toolbox (its icon looks like a wand…with magic; or press Shift-W until you have it) and click it once in the area you want to select. If it’s a solid, contiguous area of color, like a nice blue sky or a solid-colored wall, it’ll probably select the entire thing with one click, and now you can edit just that area. If it selected part of it, but not all of it, press-and-hold the Shift key (this lets you add to what you currently have selected) and click on the part that didn’t get selected (for example, if your blue sky had clouds, it may not have selected them, so press-and-hold the Shift key and click on each area of clouds to add them to your selection). Now, if it selected too much (it spilled over into areas you didn’t want to be selected), there are three things you can do: (1) Deselect the area you selected by pressing Command-D (PC: Ctrl-D) and start over by clicking on a different part of what you wanted to select (for example, if you clicked on the right side of the sky and it selected too much, deselect and maybe start by clicking on the left side of the sky and see how that looks. It works more times than you’d think). (2) Deselect, then go up to the Options Bar and lower the Tolerance amount from its default setting of 30.This determines the range of colors it will include, so typing in a lower number (like 20 or 10 or 5) means it won’t expand out so far and will include fewer colors. Or, (3) switch to the Lasso tool (L), press-and-hold the Option (PC: Alt) key and draw over the areas that the Magic Wand tool selected that you didn’t want selected.This removes those areas from the selection. I use the Quick Selection tool for selecting stuff that’s a little complicated, and when I want Photoshop to do most of the work. Get the tool from theToolbox (it’s nested with the Magic Wand tool; or just press W), simply paint over the object you want selected, and as you paint, it starts selecting. It may look like it’s doing a really bad job at ﬁrst, but after a moment or two, it reanalyzes the edges of the object and it usually readjusts itself fairly well. It usually won’t make a perfect selection—it’s just supposed to help you make your selections quicker by sensing the edges of things you’re painting over (and the more deﬁned the edge, the better it works). Once it gets fairly close, switch to the Lasso tool (L), press-and-hold the Shift key (to add to what it currently selected), and draw over any areas it missed to add them to your selection. Use the two of these tools together and you’ll save a lot of time. You get the most-used tool in all of Photoshop—the Crop tool. When you click on it in the Toolbox (or press C), it instantly puts a rule-of-thirds grid over your image (if you have this overlay option preference selected in the Options Bar), and it adds little crop- ping handles on the sides and corners.To crop, grab one of those side or corner handles and just start dragging.The areas that will be cropped away now appear darker. If you want your crop to remain proportional, press-and-hold the Shift key while you drag. When you’re done, to lock in your crop, press the Return (PC: Enter) key.There are also a bunch of built-in cropping ratios to choose from, if you already know the size or aspect ratio you want.You can ﬁnd these up the Options Bar, in the pop-up menu on the left, while you have the Crop tool selected. The“Reset” button for tools is totally hidden, and I don’t know why.To reset any individual tool to its factory-fresh default settings, select the tool, then in the left side of the Options Bar, you’ll see an icon of your currently selected tool. Right-click on that icon and a hidden pop-up menu will appear with two choices: Reset Tool, which is what you want to choose if you want to reset just this one tool, or Reset All Tools, which resets every Photoshop tool to its factory default settings.That’s it. Press C to get the Crop tool, then go up to the Options Bar and click on the Straighten tool (its icon looks like a level).Take that tool and drag it along an edge that should be straight (either horizontally or vertically), and it instantly rotates your crop so it’s per- fectly straight.To lock in this straightening, press the key. There are probably a dozen or more ways to brighten (dodge) or darken (burn) individual parts of your image in Photoshop, but you can also use a couple tools to do it. Choose the Dodge tool (O) from the Toolbox and just paint over areas in your image you want brighter.The strength of this brightening is controlled by the Exposure setting up in the Options Bar (the higher the number, the more strength each stroke has. Your strokes do build up as you paint over them, as long as your Exposure setting isn’t 100%—by default, it’s 50%).To darken an area, use the Burn tool (it’s nested with the Dodge tool in the Toolbox, or just press Shift-O until you have it). It works the same way the Dodge tool does, but it darkens instead of brightens. Note:Make sure you leave the Protect Tones checkbox, in the Options Bar, turned on all the time, otherwise it reverts to some old math and the results will be pretty horrid. Believe it or not, you can “paint” an undo (as long as you haven’t resized your image or changed its color mode from RGB to CYMK or something like that, because in that case, it no longer works).You do this using the History Brush tool (Y; its icon looks like a brush with a circular back arrow, subtly indicating that you’re going “back in time”).You just grab it, paint over an area, and it returns that area to how it looked when you ﬁrst opened the image (how cool is that?). If, when you go to paint, it gives you an “oh no you don’t!” icon, it means you did something to the image (resized it, cropped it, etc.) that precludes it from painting back to the original state you opened the image in. So, you’re out of luck in that case. TIP: CHOOSE HOW FAR TO PAINT BACK:- By default, the History Brush tool paints back to how your image looked when you opened it, but if you open the History panel (under the Window menu), you can click to the left of any of your last 20 edits and paint from that point in time instead. Lastly, if at any time in your editing process you think you might want to paint back to a particular point in your list of edits, click on the Create New Snapshot icon (it looks like a camera) at the bottom of the History panel to create a snapshot of what your image looks like at that moment. Now you don’t have to worry about only going back 20 steps in time— you can paint back to what your image looked like in that snapshot any time. 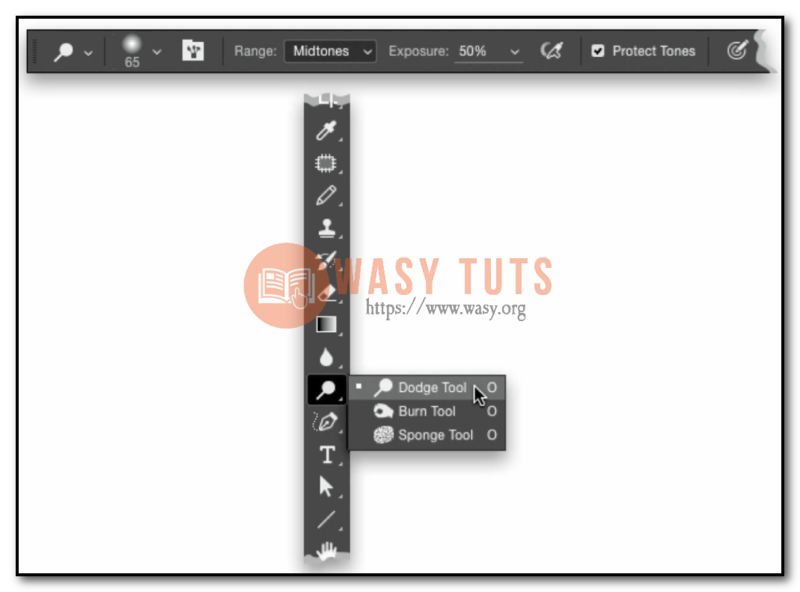 If you’ve found a particular set of settings that you really like for a particular tool (for ex- ample, let’s say you like to use the Brush tool, with a custom brush you loaded or created, with a particular hardness setting, and a particular opacity), you can save all of that as a Tool preset.Then, that brush, with all those custom attributes, will always be just one click away. You do this by setting up the tool the way you want it ﬁrst, then going up to the Options Bar, and clicking on the tool icon on the left.When the Preset Picker appears (Adobe put some default presets there, but you can delete them), click on the Create New Tool Preset icon (it’s right under the gear icon in the top right).You can now name your preset, and even choose to include your current Foreground color, if you like. Click OK and now when you want to get that custom tool, just go up to that Preset Picker, choose it from the list, and off you go!